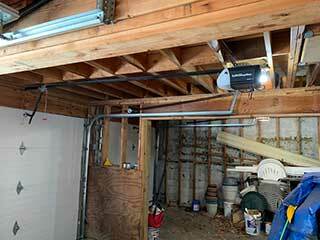 Many problems that can affect your garage door can be prevented with the right maintenance routine. While some issues can be inevitable, the great majority of malfunctions can be avoided, or at least delayed, by making sure that the different parts of the mechanism are serviced regularly. Over time, your door will most likely start to become unbalanced, which can cause it to leave a gap when it closes, and will put extra strain on the springs. To mitigate this, our technicians will perform a balance test on your door, and then adjust the spring tension accordingly. Some maintenance habits you can perform on your own, but not this one, as these parts can cause serious injuries when they are mishandled. The way your automatic door "knows" not to close on your or your car while you're passing under it is by utilizing a pair of photo eye sensors. These sensors are connected to the opener, which they alert when they detect an obstacle under the panels. If the door is trying to close, the opener will respond by reversing its movement. As you can tell, making sure the photo eyes are functioning correctly is very important, and they need to be tested routinely. Our experts will do that during every maintenance visits, and if the sensors fail our test, we'll reposition, or replace them entirely. You'd be surprised what a little drop of oil can do to keep problems at bay. During every single maintenance appointment, our technicians will apply lubrication to all of the mechanism's moving metal parts, including the drive gears, the hinges and the rollers. This will ensure that the friction that affects them will be reduced as much as possible, which will contribute to the longevity of your garage door as a whole. Having our experts at Garage Door Repair West Saint Paul service your system on a regular basis will be a great investment that won't take up a lot of time out of your day. It's a great way to prevent all sorts of problems, and it will save you a great deal of hassle and money in the future. Call today to schedule an appointment.